Warmer temperatures and anthropogenic N depositions are altering soil nutrient cycles and plant nutrition worldwide and are projected to rise dramatically in the future, particularly at the high latitudes. How much will such alterations affect symbiotic organisms such as ectomycorrhizae (ECM)? The aim was to investigate the short-term effects of warmer soil temperatures and N-enriched precipitations on roots and ECM. 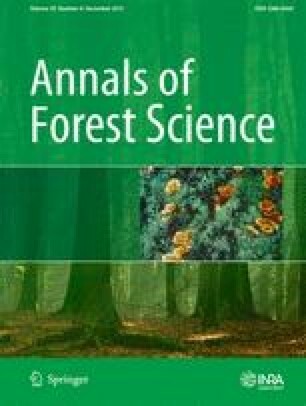 A field experiment was established during 2008–2010 in two black spruce (Picea mariana) stands of the boreal forest of Quebec, Canada. The ECM of 12 trees per site were counted and identified by morphotyping. After 3 years, soil heating markedly modified the proportions of vital root tips and ECM in the colder stand, while no effect of the N-enriched rain was observed on soil chemistry and consequently on roots and ECM. Density and ramification of root tips were not affected by the treatments. The hypothesis that the treatments would alter the ECM was confirmed only partially in the colder stand. The type of application and amount of N supplied were unable to substantially modify in the short-term growth conditions of roots and ECM, explaining the observed results. SR: experimental design, data analysis and paper writing. AB: data collection and literature reviewing. The authors thank J. Allaire, C. Boivin, M.-J. Deschênes, F. Gionest, I. Grenon, D. Laprise, C. Lupi, P. Nadeau, G. Savard, M. Thibeault-Martel and A. Turcotte for technical support, J. A. Fortin and Y. Piché for their suggestions on sampling design and A. Garside for checking the English text. This work was supported by the Natural Sciences and Engineering Research Council of Canada and Le Fond Vert du Ministère du Développement Durable, Environement, et Parc du Québec within the framework of the Action Plan 2006–2012 on climate change.